Children’s Day is a Japanese Festival held in May that honours the birth of children. Children’s Dayこどもの日・こどものひ occurs on the 5th of May and dates back to the Nara Period when it was known as 端午の節句たんごのせっく・Tango no Sekku and was a day to celebrate the perseverance, strength and well being of boys. It is the final of the ゴールデンウィークGolden Week holidays and also the most visible with many people flying Carp-shaped 鯉のぼりこいのぼり・koinobori flags from flag poles throughout the country by families with sons to celebrate the presence, health, happiness and personalities of their sons. Traditionally a large black こいのぼり鯉のぼり・koinobori, known as the 真鯉まごい・magoi representing the father, flies at the top of the pole, a red koinobori, the 緋鯉ひごい・higoi representing the mother comes second followed by a blue koinobori representing the first son. 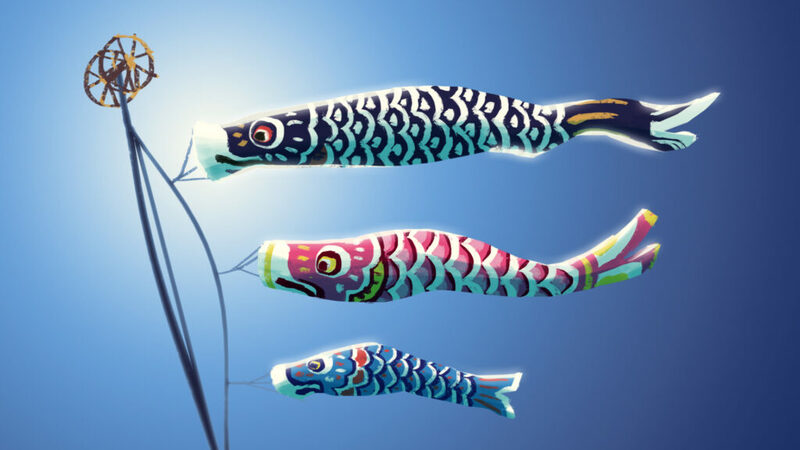 Additional koinobori are added for each subsequent son with the carp’s color and position denoting the son’s relative age. The use of the 鯉こい・koi comes from an old Chinese story of a carp swimming up a waterfall and turning into a dragon and represents the perseverance a boy and a prayer for his success in life. Besides the koinobori, 金太郎人形きんたろうにんぎょう・Kintaro dolls, depicting a boy riding a carp; and 兜かぶと・kabuto samurai military helmets are also displayed by families with sons representing the health and vitality of their children. 端午の節句たんごのせっく・Tango no Sekko was renamed こどもの日こどものひ・Kodomo no Hi after the post-War constitution took effect in 1948 and was changed to include girls and to express gratitude toward mothers but symbolically the holiday is still predominantly for boys. A girls day, known as the ひな祭りひなまつり・Hinamatsuri or doll festival, is observed on March 3rd of every year but is not considered a public holiday. A popular dish eaten during Children’s Day is 柏餅かしわもち・Kashiwa mochi, a oak leaf wrapped mochi balls (sweet red bean paste stuffed rice cakes). Because it does not shed its old leaves until new ones have grown, the oak tree is a symbol of prosperity and good fortune for ones posterity and friends.